"We all love gadgets, and none better than the teensy tools and holders we make ourselves. 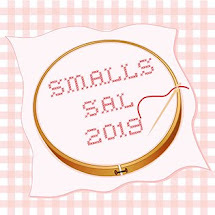 Let's stitch some smalls--needlebooks, fobs, biscornus, scissors keeps, pincushions--or knit some teensy things--amigurumi, jewellery, sachets"
I have been concentrating on LHN Home of a Needleworker this month, which is kind of a small project stitched on 28 over 1 anyway! It will be posing with the TUSAL pot on its post. I also stitched two Birthday cards which I can't show until the recipients have them. So here are some Smalls from August!! 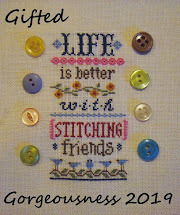 Elisa from Old Ragged Threads asked if anyone wanted to do a stitching exchange with her this year. I don't usually do exchanges because people send such amazing packages with all sorts of lovely delicacies in them that I can't afford to match but Elisa said "Just the Stitching" so I thought "Why not?" I really wanted to own one of her beautifully stitched and finished pillows! Also in the photo are some of the threads I used. I won some Gentle Arts Sampler Threads from 2 different bloggers and the colours were perfect for these designs. I also used a lovely Stef Francis variegated silk for the leaves. So which design did I choose to send to Elisa? Answer - both of them! I made a double sided pillow with a bead edging. Which seemed like a good idea at the time but took twice as long as the stitching! 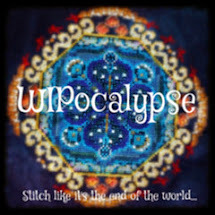 Question - would you have added the beads as you joined the pieces together or slip stitched the whole thing then gone round again adding the beads? Just wondering. I finished with a little "hand-made with love" heart (another giveaway gift) and an acorn pin from Just Buttons (yes, another giveaway gift!). This is a Bent Creek design called Signs of Autumn and Elisa also used GAST and some WDW threads too! There's so much detail in this, the leaf falling off the tree, the apples in the basket and the sweet buttons and co-ordinating ribbon, so much thought and care has gone into this pillow. Look at this cute backing fabric with its Autumn pictures, I love the squirrel. Thank You to Elisa for suggesting the exchange, it was great fun choosing the designs for you and lovely to receive such a well-made thoughtful gift (and impeccably stitched, needless to say!). So the rest of September will be LHN HOAN and then some Hallowe'en smalls! I got my copy of the JCS Hallowe'en special and instructed the Large Boy to choose his favourites while I chose mine. They co-incided on one design, the cats and pumpkin with all the little kittens peeking out from inside! So that's first choice. Finally did anyone else notice there was a design on the front cover and inside picture without a chart? It was the primitive gravestone style "Rotten but Not Forgotten". I wonder what happened there? Plum Street's "Rotted but Not Forgotted" was left out, but they posted the pattern on the magazine's website under "Corrections." I love the double-sided pillow you made!! Cute acorn button. I would add beads as I whip-stitch it together, unless I had stuffed it really tightly and was trying to make it extra-secure. So if I was sending something for an exchange...I might have done the double pass. Both the pin pillows are so beautiful! What a fun exchange! I have LHN's HOAN on my list for next year. Can't wait to see what yours looks like over 1!! so many beautiful things going on here..!! never tried this finishing before, but I've taken notes from you and the others.. thank you girls! Erin, thank you for the link! most helpful too! Elisa, you did a terrific finishing.. and picked all the right things to go with it.. ribbon, button, THAT FABRIC! ;) lucky Jo!! Hi Jo. I have received my b'day card. Thank you so much. What a special gift. I posted a pic of it on my blog with Sassy. Great exchange you did. I love the idea of a 2 sided stitched pillow. Gorgeous stitching fom both of you! I usually add the beads as I go but run a thread through the beads at the end so they lie straight. I am a Stef Francis lover too. 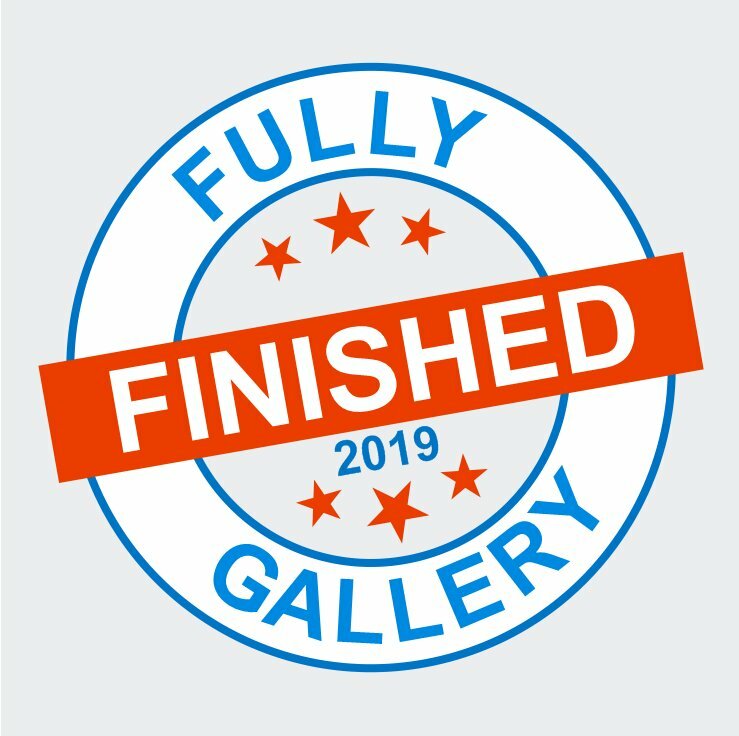 Lovely finishes, well done to you both! Hi Jo! I add the beads as I join the front and back. Very nice exchange. I especially love the silk leaves you stitched. I like your exchange - great idea doing a fall exchange - I love little gifts in the mail! You did a great job on Elisa's exchange pillow, well done. I usually add the beads as I whip stitch it together,it's quicker. LOL, I'm glad you said squirrel 'cause on first glance, I thought it was a little orange dinosaur. Totally didn't realize it was upside down, ahahaha. The exchange is great! It feels good to be celebrating autumn FINALLY. Congrats on your beading. I've decided I have a love-hate relationship with beads and I view anyone wrangling with them with new respect! Oooh, Jo!! These are so darliing!! Do you display your exchanges with the seasons? Is your home the Home of a Needleworker?